Britain's top surfers have made the most of huge waves off the Cornish coast thanks to the tail-end of Hurricane Gordon. The Gold Rush Big Wave Contest was arranged at short notice to take advantage of the 8ft (2.5m) swell at Newquay's Fistral beach. Three Cornish surfers made the final heat, and the winner was Scott Eastwood from Jersey. The British Surfing Association (BSA) got special permission from the RNLI. 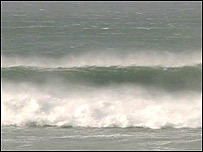 Tony Good the surf contest director said surfers were delighted with the conditions. He told BBC News: "We were forecasting 6ft-plus and we've actually had double overhead waves. "The guys are really stoked to be out there and we've probably had the best waves for a contest ever held in the UK."